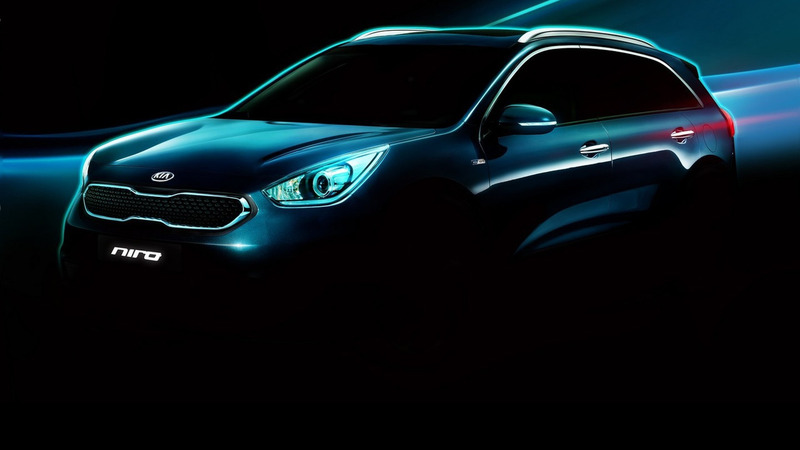 Kia has released a couple of teaser images of its upcoming crossover bound to receive a dedicated hybrid powertrain. We’ve seen it in numerous spy photos last year and Kia is now putting the finishing touches on what it calls a Hybrid Utility Vehicle (HUV). The “Niro” moniker isn’t exactly new as the company used it on a concept revealed back in 2013. The latest teasers are somewhat more revealing than the sketches published a couple of months ago and show a compact crossover borrowing some styling cues from the 2017 Sportage. While the styling may seem familiar, the Niro is an all-new model riding on its own platform and will be able to achieve a sub-90 g/km CO2 rating. Kia isn’t saying a word about the hardware arrangement, but it does mention it’s a newly developed gasoline-electric downsized hybrid powertrain. It’s safe to assume it will have the same setup as the Hyundai IONIQ, so it will likely combine a naturally aspirated 1.6-liter four-cylinder engine with an electric motor. The combustion engine is going to have 103 horsepower and 108 pound-feet of torque, whereas the electric motor will be rated at 43 hp and 125 lb-ft.
We’ll have to wait until next month for the Chicago Auto Show to find out whether our predictions are correct.